This morning, in the General Assembly plenary, a new draft resolution was introduced under the agenda item: Oceans and the law of the sea. Because there are budgetary implications, action won’t be taken on the draft until the end of December. If the resolution is adopted, the Assembly would decide to hold an intergovernmental conference, to elaborate the text of an international legally binding instrument under the UN Convention on the Law of the Sea. This instrument would concern the conservation and sustainable use of marine biological diversity of areas beyond national jurisdiction. The idea would be to develop the instrument as soon as possible. The conference would consist of four sessions, with the first taking place in the second half of 2018, and the last in 2020. Yesterday afternoon, the General Assembly took action on the draft resolutions and decisions of the First Committee, which handles disarmament and international security. It adopted 57 texts, including 53 resolutions and 4 decisions. Twenty-nine drafts were adopted without a vote and 28 with a vote. Of those 28, 11 were adopted with voting on separate paragraphs. Also yesterday afternoon, the Fifth Committee, which handles administrative and budgetary matters, heard from the Secretary-General, who introduced his management reform proposals. Most Member States that took the floor appreciated the extensive consultations conducted by the Secretary-General and his team in the lead up to the presentation of the proposal. They hoped that this inclusivity and openness would continue in upcoming phases of consideration and implementation. Most Member States and groups that spoke also welcomed the initiatives to increase transparency and accountability at the United Nations, and the overall objective to improve mandate delivery on the ground. This afternoon, the Committee will hold informal consultations to follow up on the Secretary-General’s management reform proposal. Also yesterday, the Fifth Committee began the actual negotiations on the UN programme budget for 2018-2019. The first draft contains 463 paragraphs. 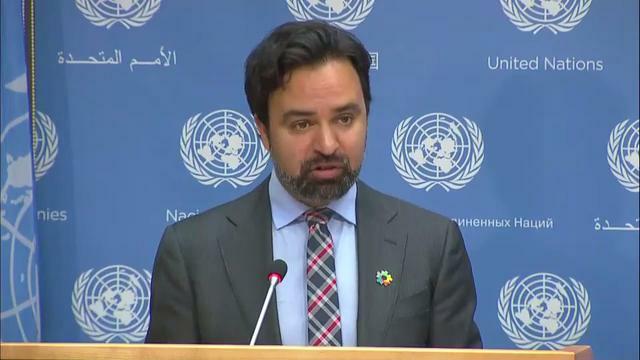 The Spokesperson was asked about the announced departure of the Venezuelan Permanent Representative, who was also the Chair of the General Assembly’s Fourth Committee. In response to a question on how the Chair would be replaced, the Spokesperson clarified that the Committee Chairs served in their individual capacities. Thus, if the Chair from Venezuela left, that did not mean that Venezuela would automatically be able to appoint one of its nationals as a replacement. In this case, there would be a nomination from the Latin American and Caribbean Group and that candidate would then be approved by the General Assembly.